Do Belgians need more action and drama in their lives? Beyond the tasty waffles, chocolate and beer, we should remember that Belgium is also home to ‘The Muscles from Brussels’ himself, action star, Jean Claude Van Damme. Mr. Van Damme aside, Turner Broadcasting has graciously stepped in to ‘increase’ the drama and action in the lives of Belgians (at least on their TVs) with the launch of TNT Benelux. To promote the launch of the new channel, TNT placed to a large red button in the middle of a quiet town square. 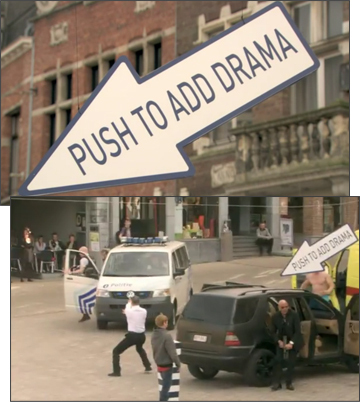 Above it hung a sign that read “Push to add drama”. Once the button gets pressed, all hell breaks loose. As residents watched in shock (or is that confusion? ), a bumbling ambulance crew drop their patient out of the back of the vehicle, triggering a bicycle accident, fight and then gun battle. And, don’t look at me, I have no idea how the motorcyclist in red lingerie or the football players fit into it all. The video has definitely caught the imagination of people with over 6.5 million views on YouTube in less than 2 days. The agency behind the campaign is Duval Guilamne. The same agency was behind the stunt for Carlsberg Beer where unsuspecting couples were directed into a biker-filled movie theatre.